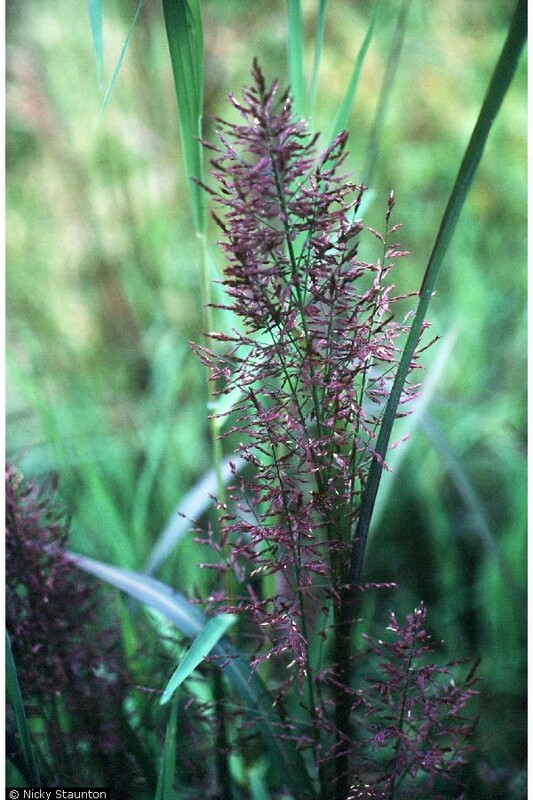 Panicum rigidulum.© Nicky Staunton @ USDA-NRCS PLANTS Database (Accessed 5/2014). Panicum rigidulum is a perennial C3/C4 (intermediate Kranz/non-Kranz photosynthetic pathway) grass (Aliscioni et al. ), coarse, tufted, to 1.5 m tall from a short root crown, tough, leafy base strongly flattened; ligule short, membranous, top ragged, sheaths flattened, keeled, hairless. Leaves of stem 20-40 cm, long, 0.4-1 cm wide, often longer than inflorescence, basal leaves crowded, shorter. Flower spikelets 0.2-0.3 cm, usually concentrated along one side of inflorescence branch, often crowded, green to purple but fading to tan with age, with several bristles at base, floret stalks 1-1.5 mm long, first glume about ½ as long as second glume and sterile lemma, fertile lemma smooth, spikelet falling with glumes attached; inflorescences at most nodes, the lower often hidden in sheath or only partially extended, branched, pyramidal to narrow, 10-30 cm long, primary branches single at many nodes; blooming and fruiting July-Sept (found with fruit falling late S). Seeds of Panicum sp. eaten by many birds. Habitat: Open areas in moist to wet soil pH 5-7.5, tolerant of fire, intolerant of shade or drought (USDA, NRCS 2010). Notes: Foliage eaten by Muskrats and rabbits (Martin et al. 1951).